TREOS Albariño is lauded in Wine Enthusiast! We're proud to share the following from Wine Enthusiast! 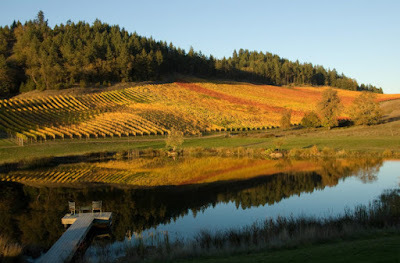 Northern Oregon excels with Pinot Noir, while the state's southern regions have turned to warm-climate varieties like Tempranillo, Grenache and Albariño. "At Treos, in the southwest corner of the Willamette Valley, a cooler location allows partner/winemaker Dave Jepson to grow Albariño, arguably Spain’s most distinctive white grape. Jepson and his Treos partners lived in Spain for a few years, where they fell in love with the wines. “We loved the crisp, mineral-driven, higher-acid Albariños that are produced in the cooler valleys in Spain’s West Coast,” says Jepson. Jepson intended to create a ‘tribute’ to those Spanish Albariños. He selected two cool-climate clones and cropped the yield back to promote intensity of aroma, flavor, body and finish. Now with six vintages completed, he says he’s found a significant increase in depth and complexity of flavor as the vines have matured. Treos Albariños have scored well, where they exhibited rich fruit and vibrant acidity." TREOS Ternion: Oregon Wine Press Cellar Select! Make the Holiday Season Brighter with Ternion! Oregon Wine Press Cellar Select!! for our port-style dessert wine.